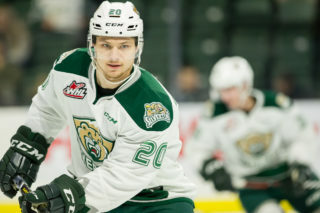 In our third of eight opening round 2019 WHL Playoffs previews, we examine the Everett Silvertips and Tri-City Americans. 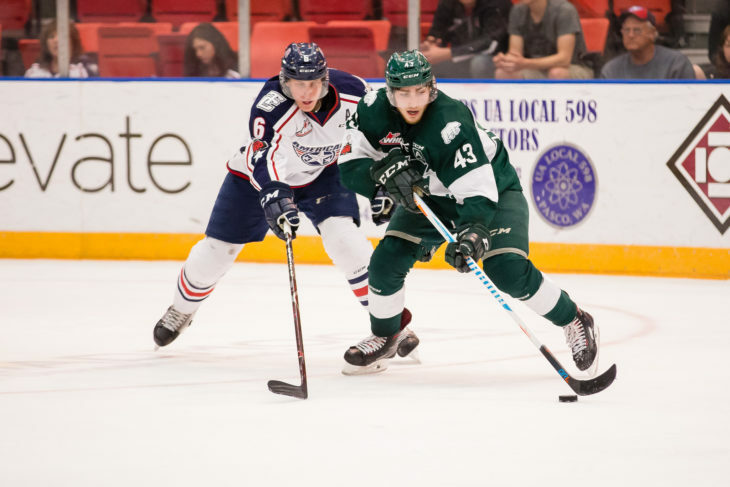 Of the eight first round series in the 2019 WHL Playoffs, none may have quite the intriguing storylines that the Everett Silvertips and Tri-City Americans have as they renew their playoff rivalry for another season. The last two U.S. Division teams left standing in the 2018 WHL Playoffs, jubilation for the Silvertips and bitterness for the Americans still lingers from the Western Conference Championship. With the Silvertips leading the series 3-2, but down 5-2 nearly midway through the third period of Game Six, the series looked like it would go a seventh game. 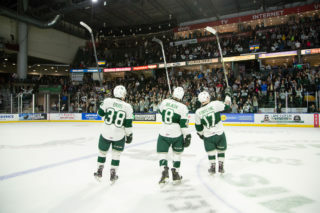 Instead, the Silvertips rallied for four-straight goals, including a game-winning goal by Kevin Davis in overtime to send the Silvertips to the WHL Championship. Those are memories the Americans would rather forget, but are still lessons they can take with them into this year’s series. With four one-goal games between the two teams this season that resulted in a pair of wins for each side, fans can expect another tight matchup between the teams. The Silvertips ultimately took five wins from the eight games in the season series. As good as the Silvertips have been this season and as much talent as the Americans may have lost over the last season, the two teams produce tight matchups when pitted against each other. Guided by the forward trio of captain Connor Dewar, Bryce Kindopp, and Zack Andrusiak, the Silvertips have had no trouble scoring when they’ve needed to this season. Teammate Riley Sutter hasn’t yet played in the 2019 calendar year, still listed as week-to-week. Should he be inserted into the lineup at any point during the WHL Playoffs, he’d provide an instant spark to an already talented offence. Countering for the Americans is 42-goal scorer Parker AuCoin. He had just two goals in the season series against Everett, but there’s no question the talent is there, and he could break through at any point against the Silvertips. Anaheim Ducks prospect Kyle Olson and captain Nolan Yaremko are coming off a career-best seasons and should be driven to make the next four to seven games tough on every member of the Silvertips. Add in the likes of Riley Sawchuk and 2019 NHL Draft prospect Krystof Hrabik and you have an Americans forward core that may not have the flashiest set of names, but can still fill then net on any given night. In net, the anticipated duel between Dustin Wolf and Beck Warm produced memorable matches this season and fans of the masked men will want to be tuned in on this series. Both have set franchise records with their respective clubs this season and will provided an added element of competitiveness to their series. 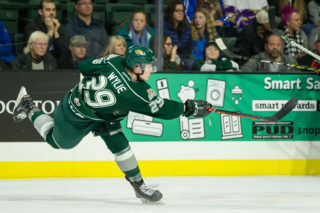 On the Silvertips’ side, NHL fans will want to keep an eye on Dewar and Philadelphia Flyers prospect Wyatte Wylie while Dustin Wolf and defenceman Gianni Fairbrother will occupy 2019 NHL Draft attention. For the Americans, Ducks’ prospect Kyle Olson represents an intriguing NHL prospect to keep an eye on while a trio of NHL Draft prospects in Sasha Mutala, Hrabik, and Mitchell Brown will also be worth watching. First Place – U.S. Division Standing Fourth Place – U.S. It all begins with the first win, then the second, and the third. Every team has their hearts set on winning 16 games to claim the Ed Chynoweth Cup, but it’s easy for teams to lose focus and not worry about the task at hand like they should. Last year’s edition of the Silvertips handled the process well, learning to bounce back after each loss or staying grounded following consecutive victories. As much as the Silvertips and observes alike may have them penciled into the WHL Championship, they’ll need to focus on each win at a time in order to put themselves in that position to still be playing in early May. The Americans have enough talent to win this series, but entering play this weekend, they have to be prepared to grind through six or seven one-goal games to make it happen. If the Silvertips continue to be stingy defensively, goals will be hard to come by for an Americans team that ranked 15th in goals for during the regular season. There are lessons to be learned in losing a tight 2-1 contest or winning a 4-3 game that the Americans can then build into part of their plan of attack. 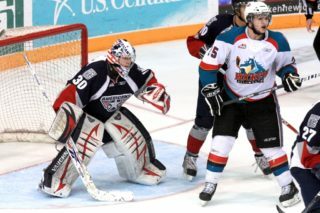 Having the deck stacked against them though is nothing new for an Americans team that surprised everyone with sweeps of the Kelowna Rockets and Victoria Royals last season. Handling the adversity of competing and gaining an edge in the opening games of the series will be a telling sign for the Americans. The Everett Silvertips trade activity this season was headlined by the addition of Zack Andrusiak from the Seattle Thunderbirds. The top-six forward chipped in 25 points (11G-14A) in 29 games with Everett and has 80 goals for his WHL career with 74 of those coming in the past two seasons. Much could be made of the leading talents of Connor Dewar and Bryce Kindopp, which they no doubt deserve. While defences figure out a way to stop Dewar and Kindopp, that could open the door for Andrusiak to shine offensively and lead the Silvertips. Also benefiting the Silvertips is his experience in the WHL Playoffs. 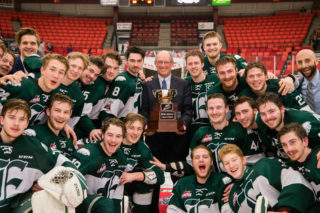 A WHL Champion with the Thunderbirds in 2017, Andrusiak is one of four current Silvertips to have won a WHL Championship and that experience could be invaluable in the first round as well as deep into their playoff run. A 42-goal campaign from Parker AuCoin led the Tri-City Americans this season, making him the first Americans skater to reach the 40-goal plateau since Justin Feser tallied 44 in the 2012-13 WHL Regular Season. One of the biggest questions this series will need to answer is if AuCoin’s offensive instincts will shine through or if the defensive stalwarts from the Silvertips will shine through. With seven multi-goal games and one hat trick this season, when things start rolling for AuCoin, it’s hard to stop him. A veteran of 262 WHL regular season games, the St. Albert, Alta. product will no doubt want to finish his WHL career on a high note. Of note for AuCoin is that three of his four goals in the 2018 WHL Playoffs came against the Silvertips. Philadelphia Flyers prospect Wyatte Wylie has continued his ascension up the Silvertips defensive charts this season, leading all defencemen in scoring with 47 points (11G-36A). Last year, Wylie had the benefit of learning from the likes of Kevin Davis and Ondrej Vala. Now the responsibility lies with the 19-year-old right-hand shot. The hometown product has just missed two regular season games over the past three seasons and has been integral to making the Silvertips the best defensive team in the league. He’ll be counted on to make sure that trend continues deep into the spring while the Flyers keep tabs on the developing rear guard. On November 26, 2018, the Tri-City Americans acquired defenceman Aaron Hyman in exchange for Brett Clayton and a third-round selection in the 2019 WHL Bantam Draft. The defenceman already has the experience of playing in the WHL Championship, beat the Silvertips along the way as a member of the 2016-17 Seattle Thunderbirds. Ready for the final playoff run of his WHL career, Hyman has been the team’s offensive leader on the blue line and will be counted on to continue providing offence at the rate he did during the regular season if his team is to have success. Dustin Wolf is confirmed good at hockey. The second-year goaltender posted a franchise record and league-leading 41 wins this season with the Silvertips while collecting seven of those via shutouts. His 1.69 goals-against-average and .936 save percentage ranked first in the league as well. Part of that defensive success can be attributed to facing 15-20 shots some nights, but in games where he was forced to make 34 or more saves, Wolf went 5-1-0-1, allowing just a single goal or shutting out his opponent in five of those games. The aura of playoff hockey differing from regular season hockey tends to be a bit cliché. That he has just nine minutes of WHL Playoffs experience under his belt shouldn’t matter too much in the long run either. After all, the likes of Carter Hart and Leland Irving had a grand total of zero minutes of playoff experience before playing the majority of minutes in their first playoff runs. The puck stops here. With a rich goaltending history, the Tri-City Americans’ franchise records at the position are no small feats. That why a franchise-record 1,925 saves by 19-year-old Beck Warm is one of the most impressive parts of the Americans’ season. Warm was also at his best against the Silvertips, posting performances of 60 and 53 saves this season for the two biggest performances of his WHL career to date. He ultimately took a win and a loss from those games, but still carried a respectable 2.41 goals-against-average and a .941 save percentage against the Silvertips. Look to Warm to be a key piece if the Americans are to have success in the WHL Playoffs. With an active streak of 16 consecutive seasons in the WHL Playoffs, success in spring has become an expectation and part of a benchmark for the U.S. Division club. They’ve also won at least one playoff game in each of the past six seasons, marked by a franchise-best 14 wins during last year’s run. In addition to seven division titles, they’ve claimed a pair of Western Conference Championships, highlighted by last year’s incredible comeback on the Americans’ home ice no less. The only thing missing from their trophy case to date is a WHL Championship. With strong talent at every position, is this year finally the year where the Silvertips finally realize their championship aspirations? 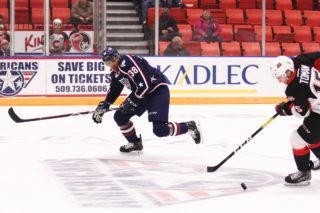 Drew Owsley posted 33 wins for the Tri-City Americans in the 2009-10 season as they advanced to the WHL Championship Series. In 15 of the past 16 seasons, the Americans have qualified for the WHL Playoffs, enjoying success other teams would be jealous of. They’ve made it to the Western Conference Championship four times in that span, advancing to the WHL Championship once. Since their inception in the 1966-67 season as the Calgary Buffaloes, they have yet to capture a WHL Championship, but have done well this season to stay competitive after losing a core of talented players to the professional hockey ranks. For the impressive playoff history owned by the Silvertips, the Americans were the last WHL team to ensure the Silvertips exited the WHL Playoffs without a win. That would be a tall task this year, but there’s no doubt the Americans have their eyes on taking down a team that’s increasingly become their playoff rival. This year’s team will go in search of another long playoff run and has the pieces to press as far as they got last season, but do they have that extra push to put their team over the top?